In their cooperation with human partners, dogs follow the behaviour of the humans while wolves lead the interaction: they are more independent. Research showed the earliest known dog species, Hesperocyon gregarius, likely pounced on its prey, just like foxes and coyotes. Scientists also determined the largest known dog species, Epicyon haydeni, were the size of grizzly bears. As faster species emerged, their inner ears grew in size. Larger inner ears help cheetahs, lions and wolves keep their head stable while moving at high speeds. These findings will be useful in modeling wolf population dynamics and in wolf genetic and dog-domestication studies. Wolves have a brief life history relative to other large carnivores, including early first reproduction, high fecundity, rapid development, and relatively short lifespans. Was that a Wolf or Coyote? We attempted to cross-foster four 18-19 week-old Gray Wolf (Canis lupus) pups into another Wolf pack 182 km from their natal pack territory. The pup introduction was the result of depredation control on a farm in northwestern Wisconsin. Three pups died within 14 days of release. 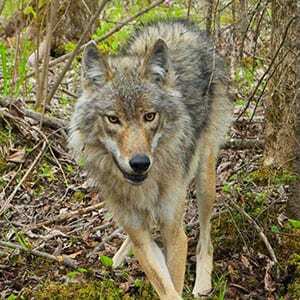 A fourth pup survived along the edge of the new pack territory over winter, dispersed in the spring, joined or formed a new pack and was captured on a depredation complaint four years later. Error: Error validating access token: Session has expired on Friday, 22-Mar-19 12:26:11 PDT. The current time is Sunday, 21-Apr-19 03:15:40 PDT.